Members and Affiliated Members of the UNESCO Chair in ICT4D would like to take this opportunity to share these images from a nativity scene in Macau earlier this month and wish all of their friends and colleagues a happy, peaceful and relaxed Christmas. According to the Gospels, Christ was born in a stable (homeless), to an unmarried mother, and then became a refugee as his parents fled from Palestine to Egypt. For those of us working in the field of ICT4D, it is a timely reminder of our commitment to using ICTs to serve the interests of the poorest and most marginalised, wherever they are to be found, and especially children, the homeless, minorities, and refugees. It was great to be back in Islamabad to participate in the second two-day workshop organised by the Inter-Islamic Network on Information Technology and COMSATS Institute of Information Technology with the assistance of the UNESCO Chair in ICT4D, and held on 5th and 6th October. It was fascinating to see the progress that has been made in Pakistan since the first such workshop that we convened in January 2016, particularly in terms of policy making, awareness, and entrepreneurial activity. It was also very good to see such a diverse group of participants, including academics, entrepreneurs, civil society activities, government officials, and representatives of bilateral donors engaging in lively discussions throughout both days about how best we can turn rhetoric into reality. The road to facilitation: financial technologies for the marginalised, with a plenary given by Qasif Shahid (FINJA) about making payments frictionless, free and real time. Addressing the digital gender gap, at which the UNESCO Chair in ICT4D spoke about why this is a pressing concern, and it gave a chance for him to tdiscusst the new UN-led EQUALS initiative for gender equality in a digital age, as well as some of the challenges that face women in using ICTs (slide deck). No tech to low tech to high tech: an entrepreneur’s tale, with a plenary by Muhammad Nasrulla (CEO INTEGRY). Serving the most marginalised: accessibility and disability, with a plenary by David Banes on access and inclusion using ICTs, which included a very useful framework for considering digital accessibility issues. Developing technologies for the rural/urban slum needs, during which Muhammad Mustafa spoke about his vision of enabling all 700 million illiterate adults in the world to go online through his Mauqa Online initiative. Educating the marginalised, where the UNESCO Chair in ICT4D spoke about educating marginalised children (slide deck) and Shaista Kazmi from Vision 21 described their Speed Literacy Program. Each session combined enthusiastic discussion around the themes addressed by the plenary speakers, and it was excellent to learn from all those involved about using ICTs in very practical ways to deliver on the needs of poor and marginalised people and communities in Pakistan. Full details of the event can be found on the INIT site, where copies of the slide decks from each main presentation will also be available. Very many thanks go to all of the organisers, especially Tahir Naeem, Akber Gardezi and Muhammad Atiq from COMSATS IIT and INIT for all of the hard work that they put into making the event a success. We look forward to convening the next such workshop in about a year’s time, once again bringing together people from all backgrounds intent on using ICTs to support Pakistan’s most marginalised communities. It was great to see Royal Holloway, University of London, represented by the Principal, Professor Paul Layzell, at the first principals meeting of EQUALS, the partnership for gender equality in the digital age, held on 16th September, just before the UN General Assembly starting today in New York. EQUALS is a very important initiative, founded by the ITU, UN-Women, the ITC, the UNU-CS and the GSMA, to reverse the trend of increasing gender digital inequality. The UNESCO Chair in ICT4D has been delighted to be working closely with the founding partners ever since the origins of EQUALS, and our membership provides an opportunity for everyone at Royal Holloway, University of London to play a part in helping to make a difference in this crucial area. Royal Holloway, University of London, has played a leading role in the higher education of women, especially in STEM subjects. Bedford College, University of London, which merged with Royal Holloway College in the 1980s to form Royal Holloway and Bedford New College, now abbreviated to Royal Holloway, University of London, was thus founded in 1849 as the first higher education college in the UK specifically for women. Staff from many of its leading departments contribute to the UNESCO Chair in ICT4D; 12 of our 28 Members and Affiliated Members are women. EQUALS has three broad coalitions, on Skills, Access and Leadership, and Royal Holloway is an active member of the Skills coalition. The College is also participating in the EQUALS Research Group being led by the UNU Computing and Society Institute (UNU-CS). It is great to see the College featuring in this high profile UN initiative, as one of only two universities among the first 24 Partners and 5 Founding Partners. I hope that the pictures below of the principals meeting, and Professor Paul Layzell’s interview, capture something of the atmosphere. In the run-up to this year’s UN General Assembly, the Office of the DG of the UN Office in Geneva has launched a novel initiative on big conversations driving the big goals of the SDGs as part of their Perception Change Project. 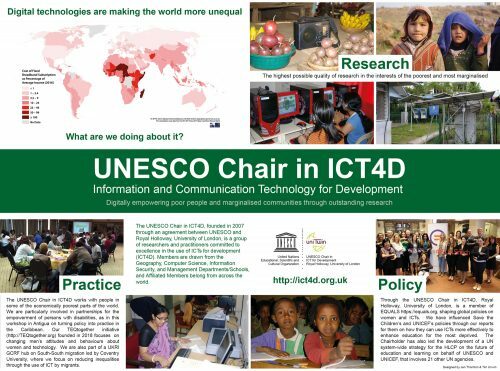 The UNESCO Chair in ICT4D is delighted to have been invited to participate in this initiative, alongside other leading figures in the ICT4D world including Houlin Zhao (SG of the ITU, and one of our Honorary Patrons), Kathy Calvin (President and CEIO, UN Foundation), and Nicholas Negroponte (Founder MIT Media Lab). Seeing the eyes of a group of street children in Ethiopia light up when I let them play with my laptop in February 2002 convinced me in an instant of the potential of technology to be used effectively for learning by some of the poorest people in the world. However, the plethora of global initiatives that have been designed to use ICTs to contribute to reducing poverty through economic growth over the last 15 years have had the consequence of dramatically increasing inequality at the same time. The poorest and most marginalised have not benefited sufficiently from the promise of ICTs. Few people pay appropriate attention to the dark side of technology, and yet we must understand this, and change it, if this potential is fully to be realised for all. In the context of the SDGs, there is a fundamental challenge. To be sure ICTs can contribute to the achievement of the SDGs, but few people sufficiently highlight their unsustainability: ICTs have seriously negative environmental impacts, and their usual business model is built on a fundamentally unsustainable logic. In terms of environmental impact, for example, they have contributed to substantially increased electricity demand, and the amount of waste in space is now presenting very serious threats to future satellite deployment. The business model, whereby people are encouraged to replace their mobile phones every couple of years, and new hardware often requires the next generation of software, which in turn then requires new hardware, is good for business, but not for sustainability. If we are serious about using ICTs for sustainable development, we must do much more to address negative aspects such as these, so that the poorest individuals, communities and countries can indeed benefit. Follow the stories at: http://www.sdgstories.com, or on Twitter using #sdgstories. Silvia Masiero (Loughborough University, and Affiliated Member of the UNESCO Chair in ICT4D) has just finished a fascinating seminar at the UNESCO Chair in ICT4D on The Affordances of Big Data for Poverty Reduction: Evidence from India, which raised many interesting questions about the relative benefits and challenges of biometric data, especially in the context of demonetisation in India. Slides of the presentation are available here, and her recent ICT4D briefing on the same subject is here.